Update: I sent feedback to reddit about this and someone nice created a bug report in response. 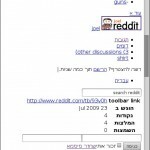 On the one hand, I admire the brave efforts of people who localize sites and applications to Hebrew and other non-ascii languages; on the other hand, (like most Israeli power users, I suspect), I hate using the Hebrew interfaces, especially when all the UI elements get flipped and moved around. Recently, I started seeing ugly unstyled pages when visiting stories on reddit.com. Which makes it very hard to get the link to the actual posted story. At first I thought the page hadn’t loaded properly, because of network issues, but it turns out the problem is that I was being served a Hebrew localized page, which was badly localized – the link to the CSS was 404 unavailable. 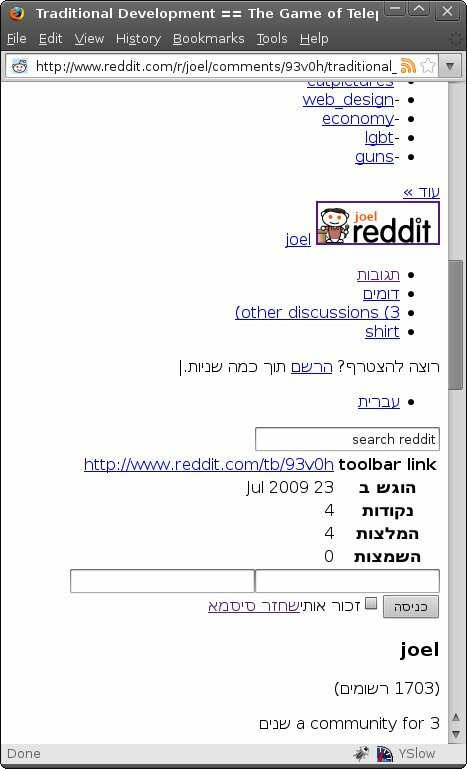 Apparently reddit will serve you a Hebrew-localized page if your browser lists Hebrew in it’s accepted languages HTTP header. Well we won’t get any if we don’t show non-English speakers that it’s available. Regardless of what’s causing this behavior, the real problem is that the resulting page is unusable and broken (unless you change your preferences – possible if you’re logged in as a reddit user), and I persume this is because of inadequate testing, which is no surprise considering the miniscule number of people who’d encounter this bug: reddit visitors that have Hebrew set as their preferred language but aren’t logged in – opinionated Israeli power users, in other words (or shlubs goofing around like me). This entry was posted in Blather, Software and Programming on August 26, 2009 by Dotan Dimet. An enormous system of caves, chambers and tunnels lies hidden beneath the Pyramids of Giza, according to a British explorer who claims to have found the lost underworld of the pharaohs. Populated by bats and venomous spiders, the underground complex was found in the limestone bedrock beneath the pyramid field at Giza. The details on that news item – the discoverer of the caves tracked down the entrance to the mysterious underworld after reading the forgotten memoirs of a 19th century diplomat and explorer , the officials scoffing his finding, the citing of ancient funerary texts – it’s all gravy. Or module. This comes via BLDGBLOG, who in the same post also links to an article from the Smithsonian on Ancient Cities lost to the Seas which opens on Dunwich, England (he also visits a fungus farm in Australia. I skim only to keep my sanity). This entry was posted in Oddities, Science Fiction and Fantasy and tagged ghouls, lovecraft, pyramids, underground on August 18, 2009 by Dotan Dimet. Damnit, Reddit, I want a boyfriend: a self-described shy 20-year old girl asks for advice on a predominantly male board about how to get a boyfriend. 10 helpful comments advise her to look past her sense that it is “social unacceptable for a girl to ask a boy out” and make the first move. Guys (well, geek guys at least) don’t understand subtle. I froze in the face of such flashing signs as “I wish I had the courage to kiss you now” (but you have a boyfriend!) and barely discerned the call to action in such cues as “I will sit here and not budge from this couch until you kiss me” and “please touch my breasts so you can admire my bra”. The counter-argument is that guys aren’t missing (all) those subtle flirting attempts, they’re actually imagining (some of) them. Those retrospective regrets we obsess over (“That girl smiled at me! She was really into me! If only I’d done something… I could kick my younger, dumber, better-looking self! “) are tricks of the mind to comfort our loneliness and make us feel better about ourselves. I’m sure that girl was just being nice. This entry was posted in Blather and tagged subtle hint on August 14, 2009 by Dotan Dimet. This entry was posted in Comics and tagged bad video, ironman2, sdcc on August 09, 2009 by Dotan Dimet.